On July 11, we hail the 115th anniversary of the birth of E. B. White. If you have followed our site over the years, you know we bow to no one in our admiration of Mr. White as both a master of simple, elegant prose and an owner of – and writer about – dachshunds. It is he who wrote the definitive words on the subject of dachshund training: "Some day, if I ever get a chance, I shall write a book, or warning, on the character and temperament of the dachshund and why he can't be trained and shouldn't be. I would rather train a striped zebra to balance an Indian club than induce a dachshund to heed my slightest command." 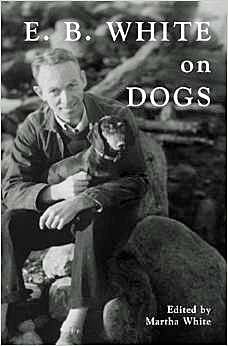 White died in 1985, but in 2013, his granddaughter published a collection of his canine-related writings called E. B. White On Dogs. If you own the published collections of White's letters and essays and poems, and if you are a New Yorker subscriber with access to their complete online archives, you have most of the material contained in this volume. But chances are that you don't meet all of those criteria. And if you did, you would still have to go digging to find exactly the piece you're seeking. How much easier to have this one slim book on your shelf. Let's make it clear right away that not every dog White owned was a dachshund, so not every item here is dachshund related. And let us also make clear – spoiler alert – that one of his dogs, a Scottie named Daisy, comes to a bad end when a cab jumps the curb. Those caveats out of the way, this book is a must for those who love both dogs and White's words. And there is a lot of dachshund material to reward the reader, particularly about Fred, White's most written-about dachshund, though he lived only to the age of 13, at which point he "died of his excesses, after a drink of brandy." The reader will be rewarded with "Death Of A Pig," in which Fred is has a strong supporting role. There's "Architects and Dachshunds" on the unsuitability of most houses and many staircases to the particular demands of a long and low dog. There's a letter to a man who had written a note of condolence upon reading of Fred's passing, in which White says that "Fred has been gone more than two years, but I can't see that he has slipped any. He's on my mind a good deal, and I'm not entirely sure that all his bills are paid — he charged everything." In a 1957 essay on getting a new puppy, White, in words that will resound with many of us, writes that, "There had been talk in our family about getting a 'sensible' dog this time, and my wife and I had gone over the list of sensible dogs, and had even ventured once or twice into the company of sensible dogs. … But after a period of uncertainty and waste motion my wife suddenly exclaimed one evening, 'Oh, let's just get a dachshund.' She had had a glass of wine, and I could see that the truth was coming out." If the truth were to come out, it would be that we love White's writing almost as much as we love dachshunds. Get yourself a copy of this book. Click here to order it on Amazon.